Geologic Time Scale, also often known as GTS, is a method of determining when certain animals lived and their relationships to each other by examining rock layers and the fossils they contain. This method of sequential dating is used by not only paleontologists to determine when certain dinosaurs lived and how they may have lived but is also used by geologists and other Earth scientists in determining the date of the planet. On this scale, time is broken down into smaller and smaller units with the largest unit being supereons. A supereon can then be broken down into eons. Eons can be broken down into Eras and Eras can be broken down into Periods, Epochs and Stages. Probably the best way of visualizing the GTS is to think of it in terms of a calendar. Condensed down on a normal calendar, a supereon would be a decade; an Eon would be a year, and an Era would be a month. Periods, Epochs and Stages (or Ages) would be weeks, days and hours, respectively. The study of rocks to determine an Earth timeline (also known as Stratigraphy) goes all the way back to Ancient Greece. This is when the famous Greek philosopher Aristotle realized that the seashell fossils he found in some rocks near his home looked liked the same seashells he could find at his local beach. This prompted him to examine them closely and conclude that the fossils that he found must have come from animals that lived a long time ago. And from this astute observation, he was also able to conclude that both the land and the sea moved over time. Although Aristotle was the first person to reason that fossils found in rocks were once living creatures, it wasn’t until the late 17th century that the principles of geological time scales were proposed by a Dutch scientist named Nicholas Steno. He proposed that over time, rock is laid down in successive layers known as strata and that this layer of rock paints a portrait of Earth’s timeline. He also concluded that the upper levels of strata must be “newer” rock and that layers below it must be older. While the theories of Nicholas Steno would eventually form the basis for the creation of the Geologic Time Scale, it wasn’t without its flaws. For instance, it didn’t take into account the fact that the rock layers could be altered over time. That they could become inverted after they’ve been deposited; that they might become tilted or that they may succumb to erosion. He also didn’t account for the fact that rock layers might have radically different appearances in different areas – even if they are laid down at the time. And probably the most important fact that Nicholas Steno failed to realize was that a rock layer represented only a small portion of the history of the Earth. It wasn’t until the mid-18th century that these issues began to be addressed and a unified scale of time periods. One of the pioneers of this effort was a German geologist named Abraham Werner who divided the rock layers of the Earth’s crust into 4 separate types. These types were the Primary, Secondary, Tertiary, and the Quaternary. During the 19th century, other scientists contributed to the field. These included scientists such as Alexandre Brogniart, William Smith, and Georges Cuvier. Before I begin listing some of the most popular periods of time in Earth’s history I would like to proffer somewhat of a disclaimer. This is not a complete list of all of the Eras, Periods, Epochs and Stages. For the purpose of brevity and clarity, I have only included the most popular and the most important ones of the prehistorical timeline. That’s not to say that there are unimportant periods in Earth’s history because all of them are important. I’m just saying some are more prominent than others. Which is why it pains me to have to decide which periods of time to include and which ones to leave out. But I did it in order to make this article more digestible to the average reader. Hopefully, I’ve made decisions that will improve the flow and readability of this text and have improved the quality of the content contain within. Another thing that I would like to add is that the estimates of the years of each era, period, epoch and stage are exactly that: estimates. While great measures have been undertaken to ensure the accuracy of these dates, you should be advised that the dates used may change from one part of this text to the next. That’s because most of the geological periods don’t have firm dates on which they are said to have started or ended but are merely estimates and can fluctuate by several million years. For instance, the Silurian Period is said to have started anywhere from 443 million to 440 million years ago and is said to have ended about 419 to 415 million years. Which is why sometimes a period of time might have one date one time and another one another time. They may also fluctuate according to the scientist or simply from year to year as new information is unearthed. Which is why there may be some slight deviations from one part of this article, or site, concerning the dates on the timeline. However, I’ve tried to be as accurate as possible considering these circumstances. As I mentioned earlier, Supereons contain several Eons in them and cover extremely large periods of time. So large, in fact, that there have only been one Superon in Earth’s history. This one was the Precambrian Supereon. Although it could be technically said that we are at the beginning of the next Supereon. The Precambrian Supereon started about 4.56 billion years ago and ended about 541 million years ago. It can be divided into 3 specific Eons which are the Hadean, the Archean and the Proterozoic. The Phanerozoic is the Eon we are currently living in. It started about 541 million years ago and continues to the present. This eon can be divided into 3 eras. These 3 eras are the Paleozoic, Mesozoic, and Cenozoic. Each of these Eras can be subdivided even further into Periods. The Paleozoic Era is the oldest Era of the Eon we’re currently living in. It started approximately 541 million years ago and ended about 252 million years ago – making it one of the longest of the Eras of this Eon. It’s name means “ancient life” in Greek and it’s known for the variety of life that rapidly began to appear. The Paleozoic Era can be subdivided into six geologic periods. These include: the Cambrian, Ordovician, Silurian, Devonian, Carboniferous, and the Permian Periods. When people think of dinosaurs, it is usually the Mesozoic Era they’re thinking of. That’s because this era is known for all of the dinosaurs that evolved during this time on the Geologic Time Scale. This era began approximately 252 million years ago and ended about 66 million years ago. This era can be subdivided into 3 periods – these include the Triassic, the Jurassic and the Cretaceous Periods. On the Geologic Time Scale, the Cenozoic Era covers from approximately 66 million years ago to the present. On the Geological Time Scale, this period of time corresponds with the extinction of the dinosaurs and the rise of mammals. Which is why it was called the Cenozoic Era because this name means “new life” in Greek. This era is divided into 3 periods which include the Paleogene, Neogene, and the Quaternary Periods. The Cambrian Period is a Geologic Time Scale period which ran from 541 million years ago to 485 million years ago. 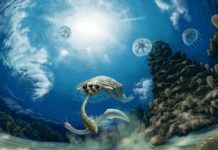 During this time, an event called the Cambrian Explosion began which resulted in an unprecedented number of creatures evolving during one single period in Earth’s entire history. Some of the flora which evolved during this time included algae and some of the animals that evolved included creatures such as trilobites. It was also during this time that most of the world’s major marine phyla started evolving. 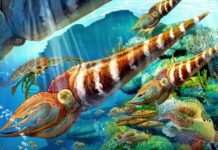 Running from approximately 485 to 440 million years ago, the Ordovician Period was a period of time in which many of the animal species that we are familiar with today starting evolving. Some of these species include cephalopods, snails, shellfish and primitive fish. This was also a period of time in which coral started evolving. 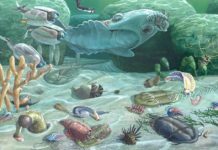 On the cusp of the Ordovician & Silurian Periods, there was a major extinction event which resulted in approximately 60% of the marine invertebrates to become extinct. This is considered to be the First Mass Extinction. Spanning from approximately 440 to 419 million years ago, the Silurian was a Geologic Time Scale period in which the Earth was beginning to recover from the First Major Extinction. It was a time when Snowball Earth began to warm and the number of marine animals began to dramatically rise. During this period, jaw-less fish multiplied, jawed fish began to first evolve and it is also the time when freshwater fish began to evolve. Starting around 419 million years ago and ending about 360 million years ago, the Devonian Period was known for an uptick in the number of fish and the diversification of these fish. This resulted in many paleontologists referring to this period as the Age of the Fish. However, fish wasn’t the only animals to evolve. This was also a time when amphibians began to evolve. It was also a time when flora such as trees began to evolve. 4 million years before the end of this period, the Second Mass Extinction hit the world. This extinction wiped out 57% of all marine genera. Starting approximately 360 million years ago and ending about 300 million years ago, the Carboniferous Period is a place in Earth’s timeline in which the average global temperatures of the world began to rise. Average worldwide temperatures were approximately 68 degrees Fahrenheit (about 20 degrees Celsius). The landscape of the Earth during this geological time scale was mainly tropical swamps. As these tropical trees began to die after their natural lifespans were over, they would eventually become peat which would then, in turn, eventually become rich deposits of coal over time. The Permian Period originated around 300 million years ago and ended about 250 million years ago. This period on the Geologic Time Scale was the last period of the Paleozoic Era. During this period, the Earth was at its driest as compared to any other previous period and it was also a period of time which were dominated by synapsids and reptiles. Conifers also began to evolve and would eventually come to dominate the dry terrain. At the end of this period was the Third Mass Extinction known by many paleontologists as the “Great Dying.” All but 5% of the world’s life would go extinct during this period. Starting approximately 250 million years ago and ending about 200 million years ago, the Triassic is a period of which is usually broken down into 3 major epochs – The Early Triassic, The Middle Triassic, and the Late Triassic Epochs. During this period, a variety of different animals began evolving including nothosaurs and ichthyosaurs. All manner of crustaceans and coral also began to proliferate. By the end of the Triassic Period, there was an explosion in reptilian evolution and dinosaurs also began to evolve. 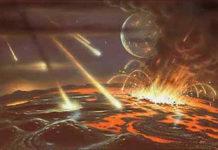 However, as temperatures on Earth began to rise, the Fourth Major Extinction occurred – also known as the Triassic-Jurassic Extinction Event. This event killed off all archosaurs, except for crocodiles, and almost all of the large amphibians that existed at the time. It also killed off over 30% if all marine animals. The Jurassic Period ran from 200 to 145 million years ago and is one of the most famous of the Periods on the Geologic Time Scale – thanks in part to movies such as Jurassic Park. This period can be subdivided into its three major epochs which include the Early Jurassic, the Middle Jurassic, and the Late Jurassic Epochs. During this beginning of this period on the geological time scale, huge prairies of ferns crossed the land masses and dinosaurs such as Diplodocus and Brachiosaurus fed off of these fern forests. True crocodiles began to evolve during this time as well. It was also the time when mammals began to evolve. However, these mammals never got bigger than a few inches long and a few ounces. 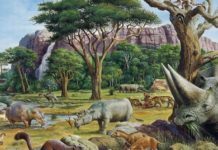 By the end of the Jurassic Period, there was an extinction called the Jurassic-Cretaceous Extinction Event that killed off a fair number of species during this time. However, this extinction event is not considered to be one of the major ones on the prehistoric timeline. The Cretaceous Period occurred on Earth’s timeline from about 145 million to 66 million years ago. This period can be subdivided into two epochs. One epoch is called the Early Cretaceous Epoch and the other one is called the Late Cretaceous Epoch. 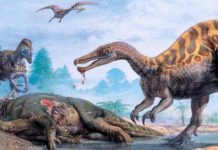 During this time, dinosaurs such as Eustreptospondylus, Carcharodontosaurus and Spinosaurus began to evolve and the Iguanodon managed to spread its kind to every continent on the planet and therefore, became one of the most successful dinosaurs of its time. Unfortunately, it was during this period that the K-T Extinction occurred, also known as the Fifth Major Extinction and our most recent one. This extinction event would bring an end to the dinosaurs and would cause 75% of the world’s species’ to go extinct. The Tertiary Period ran from approximately 66 million years ago all the way to about 2.58 million years ago. It is the traditional name for the first two periods of the Cenozoic Era and can be broken down into the Paleocene, the Eocene, the Oligocene, the Miocene and the Pliocene Epochs. During this period, mammals evolved dramatically. However, they weren’t the only animals to evolve during this time. It was also a period of time in which birds, insects, and mollusks all dramatically evolved. The Quaternary Period is a period on the Geologic Time Scale that’s known mainly for the spread of humanity and climate change. This period runs from about 2.6 million years ago to the Present Day. During this period, glaciers advanced from the poles, carving out canyons and valleys, and then retreats backward. The Earth freezes and then subsequently thaws – with the sea levels rising and falling with each wave. A few mammals grow to enormous sizes and then develop fur coats, only to disappear or be hunted into extinction. Humans evolve, spread all over the planet and then begin to alter the climate – resulting in Climate Change. And while it’s taken millions of years for all of these things to happen, on the Geologic Time Scale, it’s only the blink of an eye.